Packing and preparation are sometimes the most challenging tasks of your move. 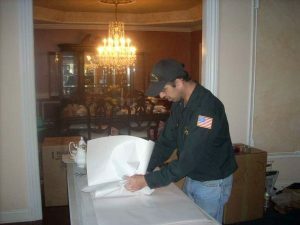 Consider using our professional packing services which provide convenience, peace of mind and can help alleviate the pressures of other obligations that accompany the moving process. Whether we pack the entire house or help with just a few items, our professional methods will save time, materials, space and will also minimize any possibility of damage during transit. During the on-site visit, our estimator will leave you with an accurate count of boxes and materials needed along with the cost for whichever level of service you prefer. We are also happy to offer tips and advice for packing yourself which may be more economical. We offer a full range of boxesand free deliveryof materials, with a full refund provided for the return of unused products.